30/12/2015 The 1901 census records Thomas as 5 years old. The family is living at Main Street, Augher. Thomas's father David is a farm labourer. 30/12/2015 By 1911, Thomas's father had died. His mother still lived in Main Street, Augher. She worked as a washerwoman. Thomas no longer lived with the family. 30/12/2015 Thomas Mossey enlisted in Augher. 30/12/2015 Private Thomas Mossey served with "C" company, in the 9th Battalion of the Royal Inniskilling Fusiliers. 30/12/2015 Private Thomas James Mossey was killed in action at Authuile, in the Somme region on 8th May 1916. He was aged 21. 30/12/2015 Thomas James Mossey was the son of David and Eliza Mossey. He was born in Augher, Co. Tyrone about 1895. 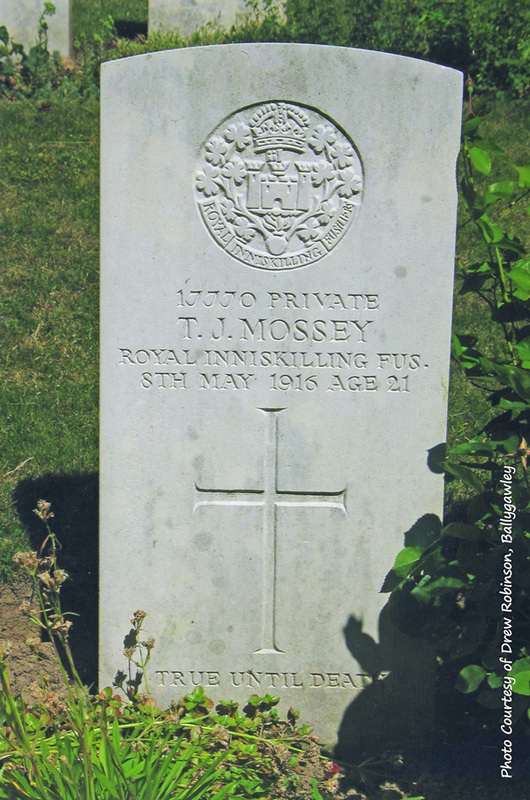 30/12/2015 Private Thomas James Mossey is buried in Authuile Military Cemetery. 30/12/2015 Family: David Mossey, Eliza Mossey, Lizzie Mossey (born about 1890), David Samuel Mossey (born about 1890) , Harry Mossey (born about 1894), Thomas James Mossey (born about 1896), Richard Mossey (born about 1899). 30/12/2015 Thomas Mossey's brother, David Samuel Massey, also died in the First World War.